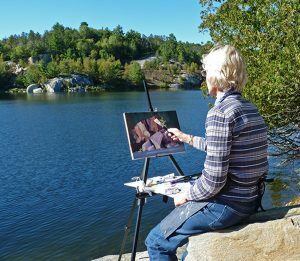 The first step was the 16×20 plein air sketch below, done at La Cloche, near Killarney, while perched precariously on a rock face across the bay. I was with a group of painters, led by renowned artist Don Cavin. We were travelling on the lake by boat, looking for a good scene to paint. 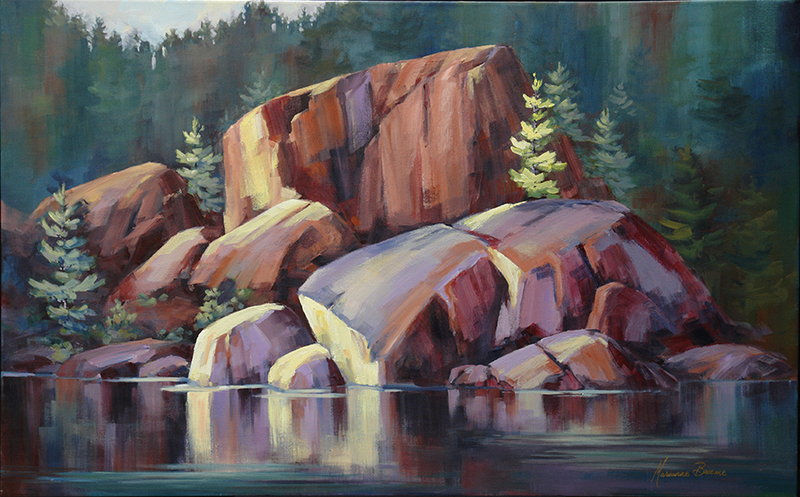 As we came around the bend I saw the early morning sunlight catching these powerful rock shapes. But there was no suitable place to set up our easels except for a steep and uneven cliff, which we scrambled up and each found a tiny ledge to paint from. My sketch was completed in about 45 minutes. I needed to capture the scene and my feeling of awe before the light changed. The rock structure was covered in evergreen trees but these were left out. I was aiming to simplify the scene in order to feature the massive rock structure. I selected one pine for my centre of focus and changed the colours throughout to convey my emotional response at the time. It took a while before I got around to the studio painting. But once I set aside the time, I couldn’t wait! When working up a sketch into a large painting there are always adjustments to make. First I need to evaluate what worked in the sketch and what changes are needed to make a better painting. This includes a look at the colours, values and composition. Then I have to consider how to make this scene work on a larger canvas. The simplicity of a small sketch does not always translate well when enlarged. 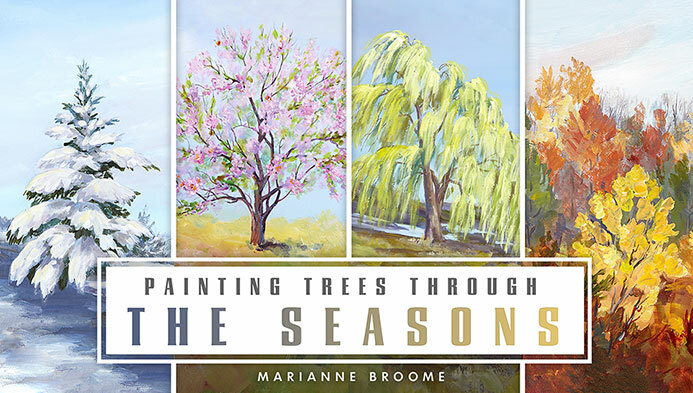 The simple, fast brushstrokes can’t be replicated in a large painting. 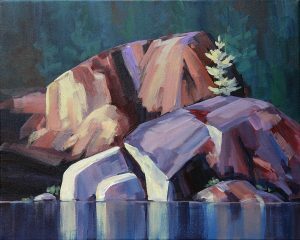 I still wanted a loose, abstracted look but one quick stoke with the the brush would not cover a large section of rock, even though I was now using much larger brushes. In this case, my canvas is a different format from the sketch, so I needed to incorporate more of the scene. As always I had taken photos while there, so was able to add more rocks on the left and right. But the larger painting needed some more areas of interest. I added some sky and a few more trees. The treatment of the rocks in the studio painting shows more faces and cracks to keep the eye engaged. I added more of the red/brown and toned down the purple, which may have been overpowering in a larger version. But the overall feel is the same and I am very pleased with the result. I encourage you to get out and do some plein air sketches. The changing light makes you paint fast and there is nothing like capturing the “feel ” of the place while you are actually there!